Freshwater is essential to our lives and economy. We depend upon it for drinking and bathing, as well as to run our industries and agriculture. According to New Hanover County’s planning department, the County’s population is expected to add approximately 100,000 people in the next 25 years. Growth without reliable water supplies will be difficult. The increased demand for freshwater in New Hanover, Pender, Brunswick and surrounding counties brings to the forefront the need to manage the use of this precious resource wisely. 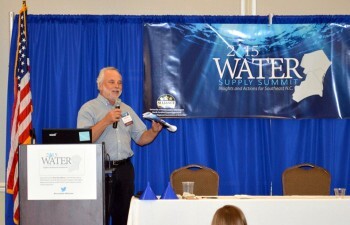 On October 28, 2015, Wilmington Regional Association of REALTORS®, UNCW Masters of Public Administration Program, and the North Carolina Coastal Federation held a comprehensive one-day summit that addressed the challenges and solutions for maintaining our water supplies over the next few decades. It identified what prudent management is necessary to prepare an adequate supply of clean water for our communities. What are the studies and modeling showing us? A recent United States Geological Survey (USGS) study of New Hanover County revealed concerns about increasing salt water intrusion and lower water levels in our important groundwater aquifers. The USGS has identified southeastern coastal North Carolina as an area of concern for sustainable water resources and without proper long range planning it will face critical water shortages. Our surface waters are connected to our groundwater aquifers therefore good stewardship of our surface waters directly depends on proper water supply management. Low flow readings in the Cape Fear River has identified critical and emerging issues that need to be addressed to ensure a sustainable and adequate water supply capacity for our region. New Hanover County’s new comprehensive planning process provides a way to plan for water needs to ensure economic growth while protecting water resources. Strategic Plan and the Future: What Now?